Suicide Squad had issues. That’s just an objective, verifiable fact, like the sky being blue, the sun being hot, and Jared Leto‘s Joker definitely being super into Korn. Between the shoddy edit job, familiar plot, and inexplicable needle drops, it’s impossible to say what, exactly, would have fixed the film. Which is why it’s hard to tell what to make of director David Ayer revealing his original concept for Suicide Squad, which involved eventual Justice League villain Steppenwolf controlling Cara Delevigne‘s Enchantress with a Mother Box and taking part in the film’s climactic fight scene in place of Incubus (Alain Chanoine). Responding to a question on Twitter about Suicide Squad concept art that showed the Big Bad and his Parademon minions, Ayer confirmed the early plans. 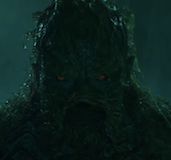 The director also noted that the gooey sewer monsters that served as Enchantress’ minions throughout the film were first conceived as Parademons. Either way, Margot Robbie‘s stand-out performance did result in a spin-off for Harley Quinn, Birds of Prey (And The Fantabulous Emancipation of One Harley Quinn). Word on the street is that James Gunn—who was booted off the Guardians of the Galaxy franchise by Disney after some old Tweets resurfaced—is getting a crack at the Suicide Squad sequel, so all this convoluted DCEU fun is just getting started.